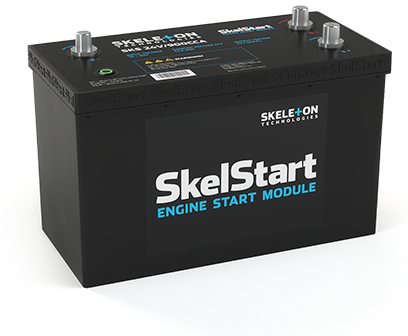 The SkelStart Engine start module will keep you on the road – always. With SkelStart, you don’t have to worry about dead batteries, jump-starts, or lost time and productivity due to old batteries. The SkelStart Engine Start Module is build with technology developed for the European Space Agency, so you can be sure it has been tested in the harshest of environments. Environmentally friendly – uses no lead or acid. Faster and more reliable engine starts saves you time and reduced fuel consumption and extended battery life saves you money. Most of the problems truck drivers and truck owners face starting their trucks are related to batteries. SkelStart is connected directly to the truck’s starter engine, which means that it bypasses the batteries and therefore the problems that batteries might cause. SkelStart works even in extremely cold weather conditions (-40 °C) and will maintain near full capability even if your truck has been standing unused for months. You can be sure that your engine will start every single time.